So Very Sorry for the delay in getting the reveal underway! I am feeling loads better now, after having a few days of semi-rest. You know me, I can never really be down and out for too long. I'm always on the move. So, for this challenge, we each used a set or SETS of these Resin bauble sliders from Michael's. I have been thinking about what to do with these since I got them and then I got this nasty cold, so my ideas were on hold for a few days. Today, I went back to Michael's and got a few more packages of the purple/peach sliders so that I could get a real statement piece crafted. 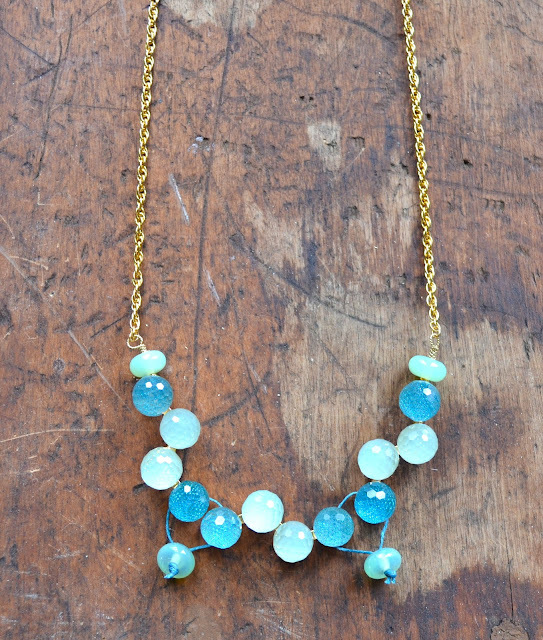 Heck, I may even try to find a dress to wear this necklace with for my sister's wedding! I made the main piece using the purple and peach sliders, some leather cording, seed beads, and some wire wrapped Faceted Ametrine barrels. For the enclosure I created a button and hook type clasp with an old vintage gold colored button, and a Vintaj Brass Co. shepherd's hook. I used just one side of the sliders to string them onto leather cording with some coral color seed beads in between to space them out. 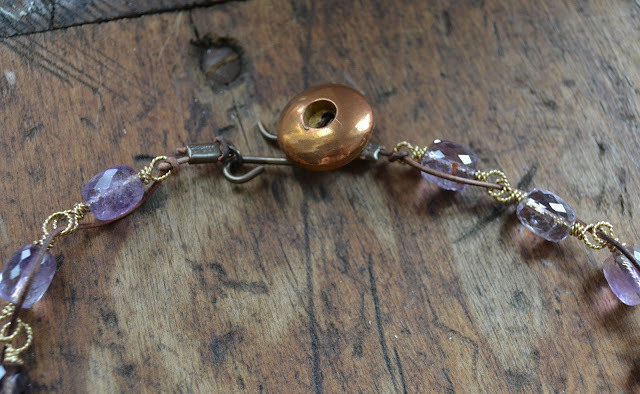 To jazz up the leather, I wire wrapped some faceted barrels of beautiful purple Ametrine onto some new twisted wire from Beadalon. I simple thread the wire through each wire wrapped loop and finished the back with a button and hook clasp. I really love how it turned out, but it is a little heavy. I worry I won't be able to wear it but we'll see. I haven't even started shopping for my dress yet for Franny's wedding. 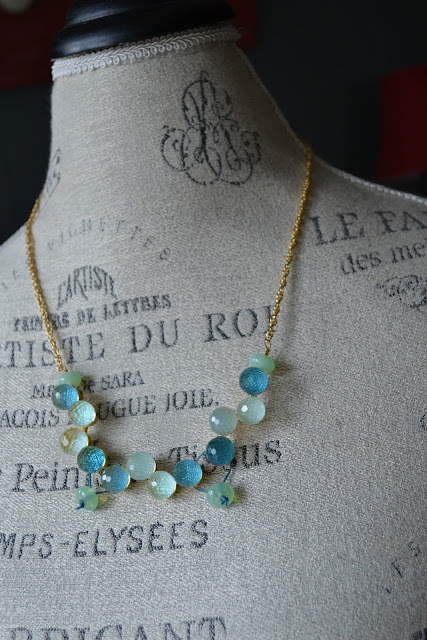 I had a set of the aqua sliders too so I used them in a more simple necklace with some gold plated chain, linen cording and a few lampwork glass spacers from Gardanne Beads. I like how it lays when the beaded section is at one side of the necklace instead of at the dead center front. To attach the sliders I thread the linen cording through the slider holes and pulled the ends together, strung a lampwork bead, and then tied an overhand knot. Here is Terri's post, she was unable to blog her projects so I offered to show her post and photos here! For me, the hardest part of this challenge was deciding whether or not to try it. I found out from other Michael's Challenges that Lorelei has had tha my two closest Michael's stores dont have the best jewelry departments. Some of the components weren't in the two stores that are 45 minutes from my house. I did discover, quite by accident that a town about an hour and a half away had a Michael's that carried everything I'd ever seen in a Lorelei Challenge. So after the brief, initial sign up was over, I found the time to drive to Fairlawn to look for the goods. After all, I reasoned, it would be worth the trip no matter what because of the 50% off sale! And oh! The decisions! I liked both resin color pallets, but I decided to go with the aquas because with brown hair and brown eyes, I look good in all shades of auqua, teal, and turquoise. I would have lots of clothes I could wear my design with. But since I have a limited stash, I decided to browse the jewelry pieces parts until I came up with some other components to work with. The resin was kind of blingy, so blingy stuff seemed the direction to go. And with th intense faceting in the resin, I decided faceting should also factor into my choices. I was thinking bracelet, since the resin was kind of heavy and would be hard to balance in a necklace, plus I though I'd wear a blingy bracelet more than a flashy, statement-making necklace. 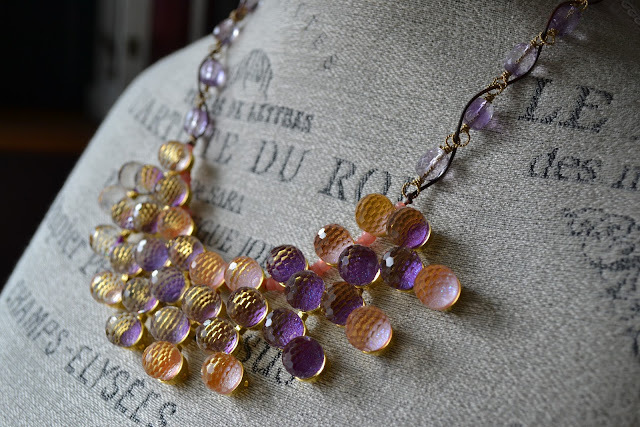 I browsed a long time, and decided on some quartrefoil-shaped resin beads that were covered with square facets. 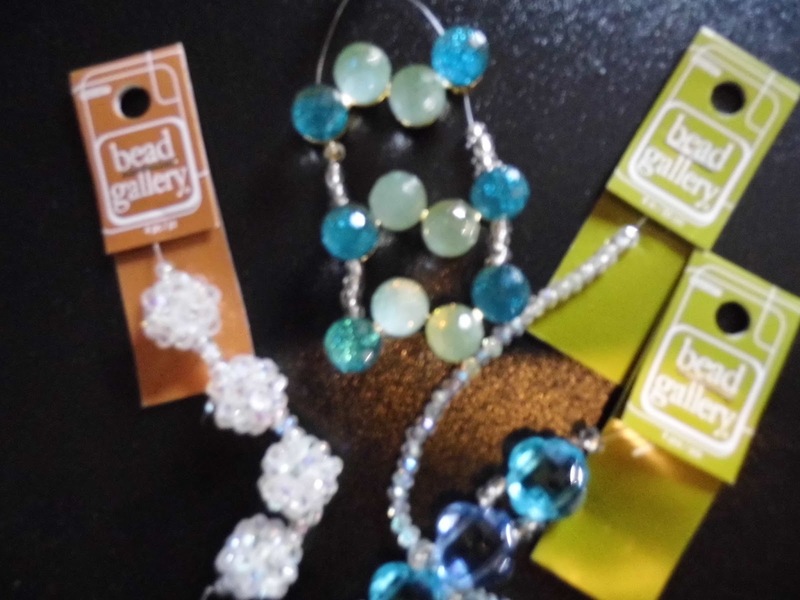 The label said "aqua glass 18mm," but the four pieces per strand alternated auqua beads with blue beads. I decided to use just the aqua and keep the blue for another project. The 18 mm size was a good match for the long resin components. And since the center spheres in the resin peices had a whitish, golden cast, I decided to pick up several strands of glass rondell 3x4 mm crystals to use to tie the bracelet together. The gold hardware meant I'd need to follow through with gold in the rest of my design, so I chose gold color Beadalon stringing wire and looked for a gold clasp. On area that Michael's could improve on is their selection of clasps. I didn't find anything in gold that struck me as a possiblity, but I did stumble onto some neat, clear crystal beaded beads that matched my little crystals. 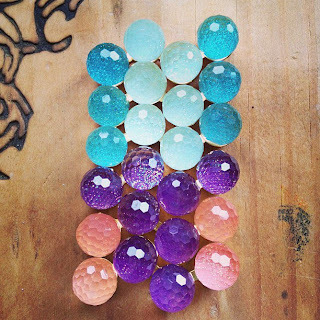 I decided one of them would be perfect to combine with a beaded loop of the little crystals for a closure, and it's spherical shape matched the resin spheres while the size went well with the size of the quarefoils. When I sat down to construct the bracelet, I wanted to use two of the aqua quatrefoil beads offset between each of the resin components to help get more balance between the size of the resin pieces and the quatrefoils, but I was having difficulty figuring out how to work with four strands of beading wire with two holes in all of the components. So I finally gave that up in favor of getting the piece finished on time. 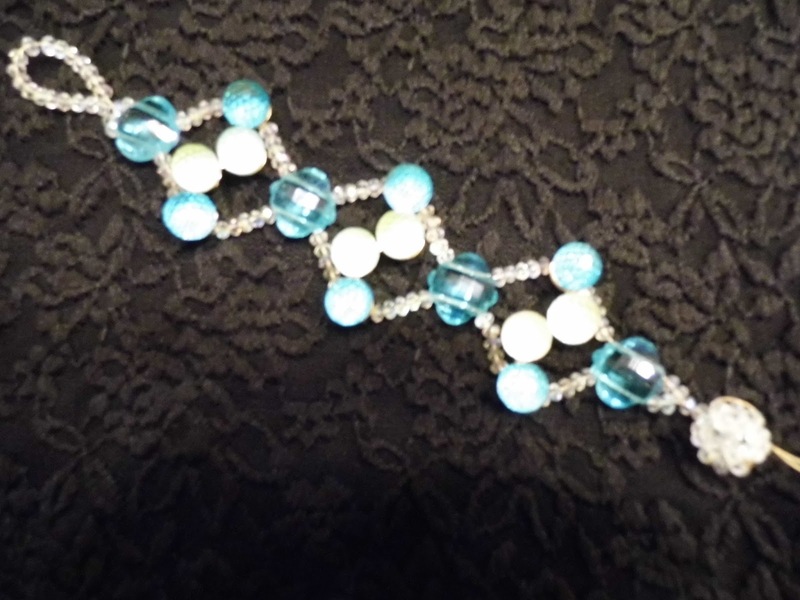 I really like the way it turned out, but I just tied off the beading wire so I could photogrph it, since I think it would lie a little nicer if I shorten the connecting crystal strips by just one bead. The fit is pretty good now, but I think that little tweek will make me happier with it overall. I'd like to thank Lorelei for coming up with this challenge. It was a real stretch to work with something so interesting that I know I wouldn't have picked up on my own and it's fun to see what everyone has come up with! Getting out of one's comfort zone can be a little scary, but fun in the end! I love, love both of these! So happy and colorful! Oh my gosh, that is funny that statement necklaces came to mind for both of us! Thanks for hosting this challenge - it was fun and I'm glad I got to participate this time around. This necklace would be PERFECT for the wedding! You are so creative ...love both versions! These are so lovely. Especially like the first one. You do such a great job with mixing metal and leather with these beads and they still have such great proportion. 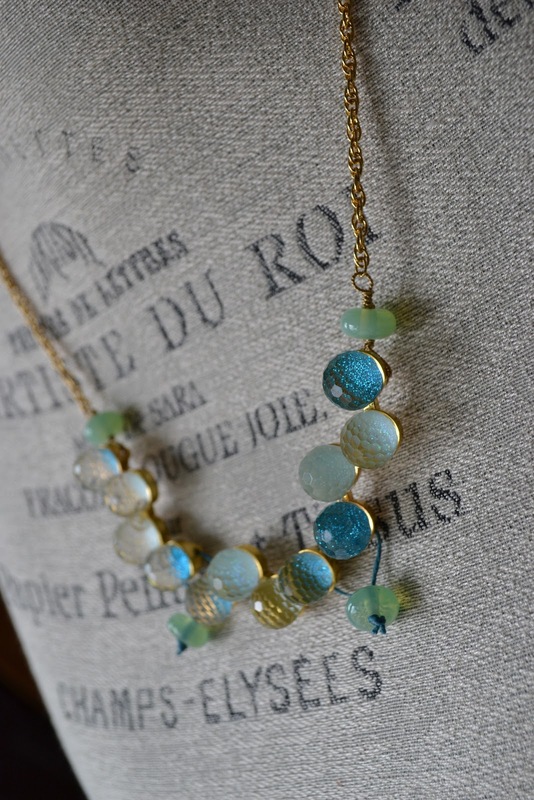 You make working with those resin sliders seem effortless, Lorelei -- both necklaces are gorgeous! Thank you so much for hosting this fantastic challenge ... I really enjoyed it! What beautiful designs! I especially love the first one-what a statement piece! It's bold style is fantastic, right up my alley. Those are awesome. I love the statement necklace. I hope it isn't too heavy because it will look amazing when you wear it. I also love how the blue slider necklace looks like two totally different designs depending on how it's worn. Thank you for hosting this challenge. I really had fun with these sliders. This looks like a lot of fun! I hope I can participate if you host another challenge! I love the statement necklace. So chic! It's perfect. 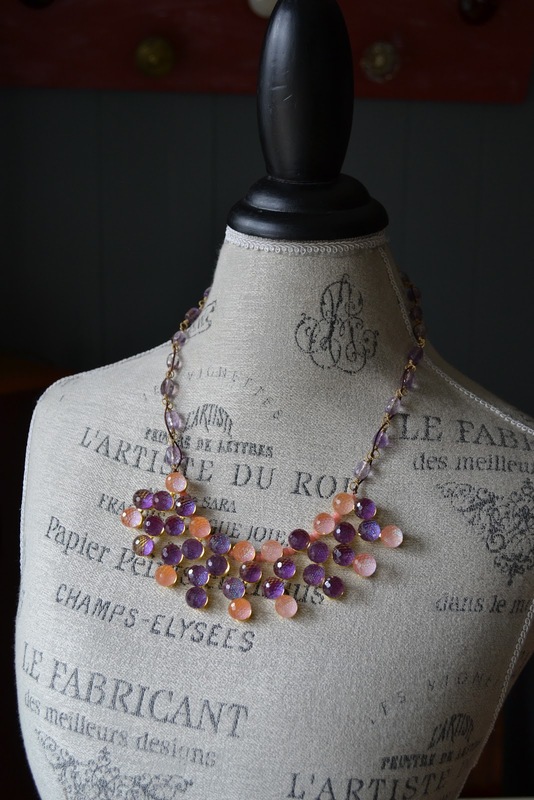 The purple and peach necklace is SO lux! I bet you'll have a great time finding your dress! You guys look like you're having so much fun with these sliders! That first necklace is the bomb! so very chic!! 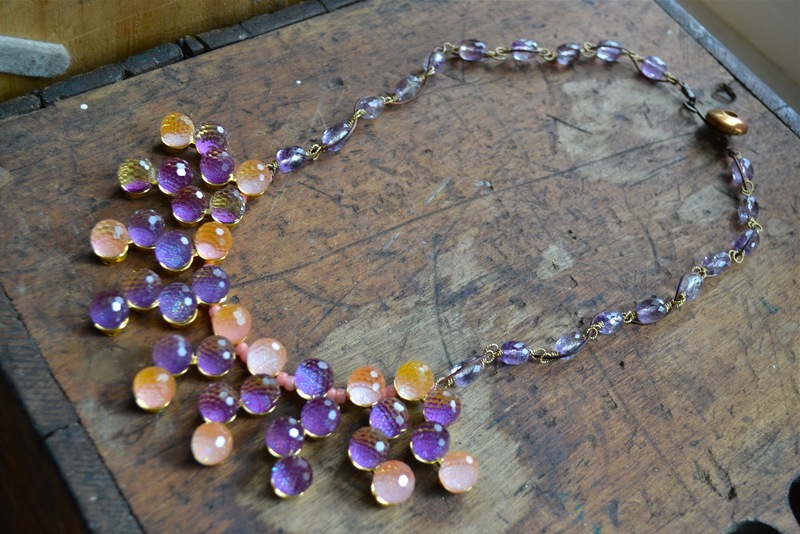 I love the look of the first, especially the facets of the ametrine that really bring it all together. I can see though with I guess about three sets (i didn't cout :)) it could be weighty. Although with a wedding you practically have to take something off by the end of the night - ah usually the heels, but we you know what I mean. I really like the simplicity of the second one and agree, it looks so pretty on the side. Oh these are great designs Lorelei! 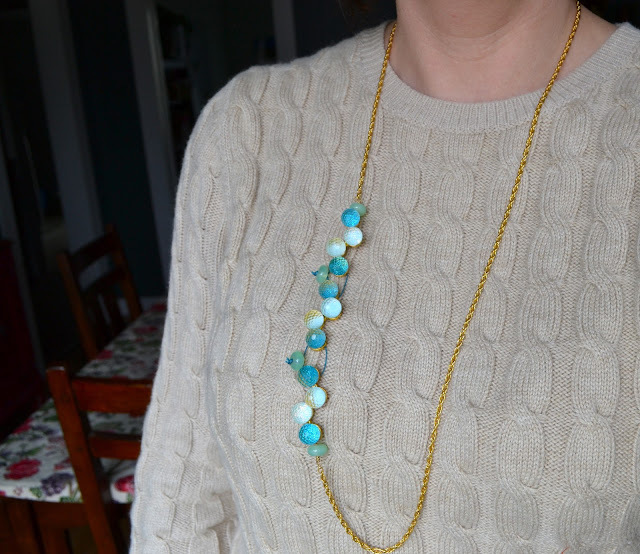 I love how chunky the first necklace is and even if it is a little heavy, won't it be so fun to wear?!?! The second one is my favorite because I just really like the aquas. Very cool. Thanks for hosting this challenge. I would have never even think about picking these guys up if you hadn't planted the idea:) Happy Easter. Oooh! just love the purple and peach one with the ametrine. Thanks for the challenge! Hi Lorelei, I just found your blog this morning and wow what a great day to find it! I really love what you did with this challenge. I teach jewelry classes at my local Michaels' store and our instructors have all been been playing around with the whole line of sliders. Lots of cool projects but no one thought of using these. Both your pieces are GORGEOUS, but I have to say I think the second one is my fave just 'cause I'm not a "statement piece" kind of person. (can't pull off the look on myself but I love to ogle them LOL) Thanks for adding Terri's piece too, to think we wouldn't have seen it if you hadn't... I absolutely love her bracelet. Can't wait to see the other participants pieces as well. I blew my "bead budget" already this month or I'd sign up for the challenge. I have been playing with some of the other sliders to make the mandatory class samples and if you'd like you can see some of them here: picasaweb.google.com/115553289028938495008/NewClassSamples. Looking forward to checking back and seeing what you're up to next. WOWZERS! Both necklaces are stunning! My jaw dropped when I saw the first one, and the second is something I think I would wear every single day! Hi Loreli! I love your book. However I am finding it extremely difficult to find the 18mm printed cotton ribbon you have listed on pg. 96 for "batik boutique". I visited the website listed on the credits page, but can only find dyed silk ribbons there. Could you lend me a hand and tell me where I could find them? I would really appreciate it. The purple and peach combo is so lovely. Great job on all the designs but, that one is a show stopper! The colour of those baubles really is so vivid isn't it? I love that sea blue.